Buckwheat is the grain of choice when it comes to fasting in India. Every navaratri, my mom makes paranthas with what's locally called 'kuttu ka atta'. The dough is made with a combination of buckwheat and mashed potatoes, then rolled out and shallow fried in ghee. It's delicious enough to make atheists like me pretend we're fasting. But because this is fasting day food, you don't do much to the paranthas beyond eating them with yogurt. The Russians on the other hand make a fine art of topping their version of buckwheat pancakes, the blinis, with salmon and caviar and sour cream. The pancakes themselves are a bit bland though, a pale match to the dark beauties that Indian kuttu paranthas are. So why not combine the two, I thought. Make a base of mini buckwheat paranthas Indian style, then load them up like a blini. The resulting dish packs quite a punch. Some dishes take you by surprise. In the middle of a quiet dinner, they grab you and force you to sit up and take notice. It's even more surprising when that dish happens to be soup. It happened so at a dinner with my friend Chris. We started off with his lovely homemade bread and salad and then he brought this soup in. A soup with punchy flavours that also freezes well. I eventually got the recipe off Chris and I now make this often, leaving bowlfuls in the freezer for a rainy day. You should too! May and June are my favourite months of year food-wise. It's when all the best fruits are in season at the same time. For about a month, I go crazy eating my fill of fresh peaches, plums, cherries, litchis and apricots. Then monsoons kick in and all the fruits vanish at about the same time. This is the last dessert I made this year with my fruit bounty. A plate full of plums, peaches and cherries, the flavours bound together with the easiest pudding you can make. And a sprinkle of almonds to bring in a much needed crunch. Posset is a pudding that sounds impossible. But it's far less fussy than your typical mousses et al that require scary combinations of hot liquids and egg yolks. There are no eggs in this funky British dessert. Instead, your purposefully curdle cream with lime juice. It all feels like it shouldn't work but it really does end with a creamy, delicious dessert. The first time I heard of nori granola, I was instantly impressed by how brilliant the idea is. The recipe by Heidi Swanson, one of my favourite bloggers, combines the salty seaweed with a whole lot of complementing and contrasting flavours. There are oats, obviously. But there are also less obvious additions like cashews, fennel and sesame seeds. All bound together by a tiny amount of honey and olive oil. This isn't breakfast cereal. This is a grown up granola that's perfect for snacking. I'm yet to try it with yogurt but I've already scattered it all over a bowl of pumpkin soup and it was delicious there too. Heidi says to use up the granola in a week so what follows is half her recipe. The other day, Food52 published a story on their most popular genius dessert ever. And it turned out not to be something faffy or chocolate-y or fruity. Instead, it was the plain and humble olive oil cake. I've never baked with olive oil though I have used the more neutral oils in cakes before. This one does let the olive oil shine with all its personality. This is also one of the simplest cakes you will ever bake, so maybe that accounts for the popularity. The original recipe is for a full cake but I reduced it to a third and baked 6 cupcakes instead. Mine's also a pale vanilla colour whereas the one on food52 is a rich brown so there is a chance I underbaked it. It's quite soft and nice and tasty all the same. Line 6 muffin tins and set on a tray. Preheat the oven to 180C. I first saw this black bean soup on David Lebovitz's blog about a month back. I made it almost immediately and loved it. Then I made it again and then I made it a third time. I have been tinkering with the recipe and while I think the soup is now perfect and one of the best I've ever made, it no longer bears any resemblance to what David made. Which is why it seems right to share this recipe here before I forget it. The key difference is that I use canned ancho chillies and other pantry goodies whereas David uses a lot of fresh vegetables. They are both great so pick the recipe depending on what you have in the pantry or fridge. Here's my version. Valentine's Day is just a day away which means that right now, you are in one of the two categories. You either planned ahead and have dinner reservations at a trendy restaurant and a box of chocolates tucked away to bring out at the right moment. Or you are looking for excuses on why celebrating love just once a year makes no sense, driven largely by the fact that everything is too cheesy and too crowded and too sold out at the moment. I personally remain a fan of staying at home not just for Valentine's but also for other crowd attracting festivals and new year's eves etc. This usually translates to ordering in pizza. But one thing I never order in is dessert. This particular year, food52 came up with an idea so genius and so easy just in time, I haven't even had to research cake recipes. For what they have is a super simple, super easy and completely fuss free chocolate mousse. It was the evening of 3rd February, 2008. I had just baked my first cookie, and I was mighty proud of myself. This was the time before smartphones so I found my point and shoot camera and took a picture of the chocolate shortbread. Then, not knowing what to do with it and where to save the recipe, I went to blogger and set myself up a blog page. I thought it will be a good way to store recipes as I bake more. I couldn't have thunk that I will sit here, the morning of 3rd February, 2018, celebrating ten years of blogging. 400 recipes and countless friendships later, the blog is now an integral part of my life. 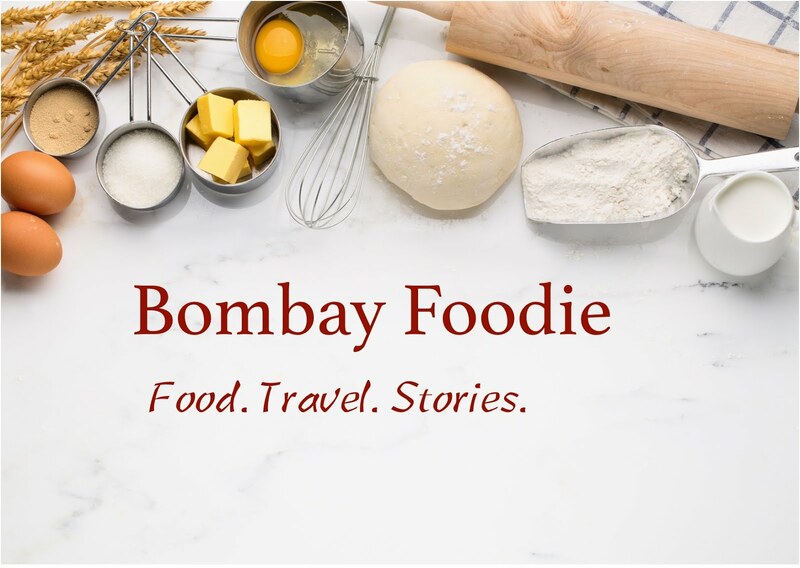 As I have tried new foods, met fantastic people and gone on fabulous journeys, Bombay Foodie has witnessed and chronicled it all. My recipes may look more complex now than 2008, my food a bit more nuanced, and I am surely a better cook thanks to all the experiments and all the failures I shared with you.